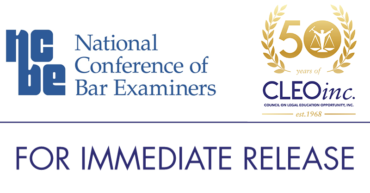 The National Conference of Bar Examiners (NCBE) and the Council on Legal Education Opportunity, Inc. (CLEO) are pleased to announce a new collaboration in support of their shared goal of increasing diversity and inclusion in the legal profession. NCBE has provided funding to bolster CLEO’s programs that help individuals from traditionally underrepresented racial and ethnic groups and disadvantaged communities achieve success in law school and prepare to take and pass the bar exam. For over 50 years, CLEO has successfully contributed to increasing the number of lawyers from diverse backgrounds in all sectors of law.